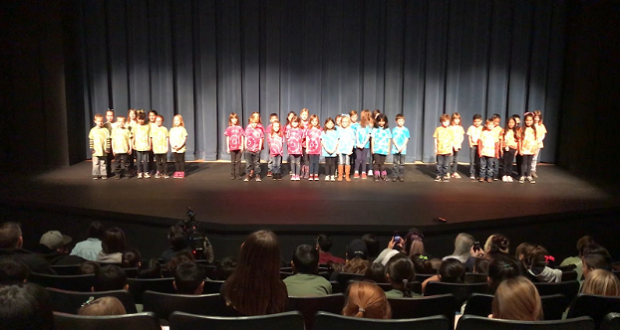 OAKHURST — The first grade students at Oakhurst Elementary once again had the privilege of representing the school at the annual Peach Blossom Festival at Fresno State on earlier this month. The purpose of the Peach Blossom Festival is to expose children to oral interpretations and allow them to have a positive experience at Fresno State. Children from all over the Central Valley are invited to attend and perform. It has become a tradition at Oakhurst Elementary School (OES) for the first graders to go to Peach Blossom as a large group. The first grade teachers encourage all of the students to participate and practice memorizing a story or poem. This year, teachers chose to have the students perform “Pete the Cat: I Love My White Shoes.” The students worked hard and practiced two to three times a week, over the course of two months. Once we arrived and made our way into the large auditorium, our 35 first graders were ready to take the stage in their tie-dyed t-shirts. Hearts pounding, faces smiling, and ready to perform. All performers received “SUPERIOR” on their performances!